Kader, Bachmann’s parent company, originally produced this HO-scale GP30 diesel locomotive model in 1976 for Lionel-HO. The GP30 diesel was part of Lionel’s second venture into the HO-scale train market that got its start in 1974 and lasted until 1977. Bachmann first catalogs the GP30 in 1979 with three road names listed: Burlington Northern, Chessie System, and Santa Fe. 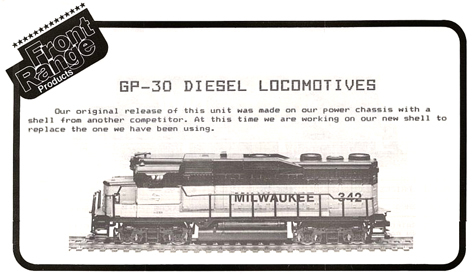 GP30 diesels sold for $16.00, according to the 1979 catalog. Bachmann’s stock numbering system changes beginning in 1982 and the three digit GP30 stock numbers turn into seven digits. 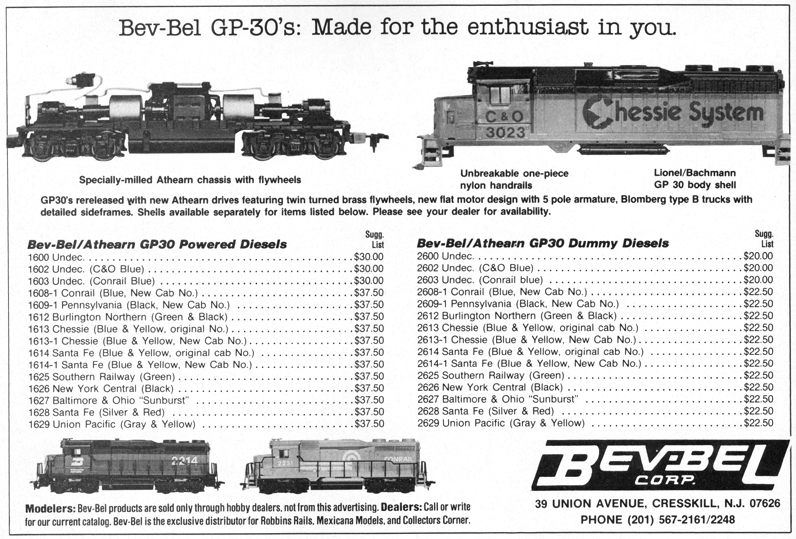 The GP30 remains pictured in Bachmann’s catalogs through the 1988 edition. 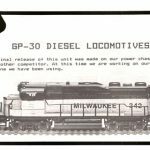 The 1988 catalog shows the model, but includes a banner reading, “DISCONTINUED,” this would be the same year that the model was revised and helped introduce Bachmann’s Spectrum line. Going by Bachmann’s catalogs, the GP30 was never included in any train set offerings. Bachmann, to date, has never cataloged an N-scale GP30 diesel model. This GP30 model has certainly enjoyed some success since its introduction under the Lionel-HO name in 1976. 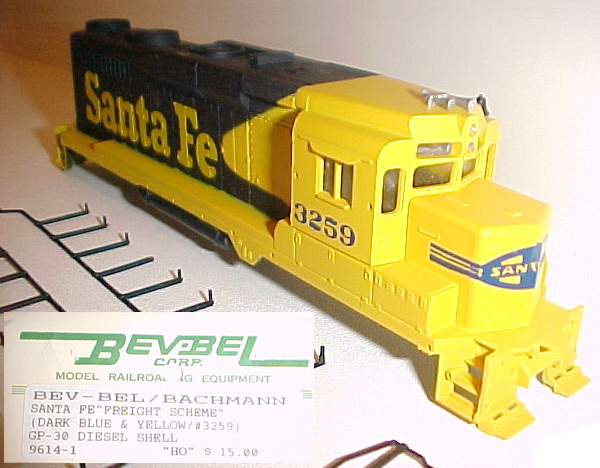 Bachmann cataloged the model as a standard line offering from 1979 through 1987. The GP30 enjoys enhancement revisions in its tooling and a new drive is created and it becomes of the first models in the Spectrum line from Bachmann in 1988. Following its many years as a Spectrum entry, Bachmann provided a revised drive with a factory-installed DCC (Digital Command Control) decoder and the GP30 was back again as an EZ-DCC line release in the 21st Century. Regular DC GP30 models are also part of the contemporary Bachmann line. 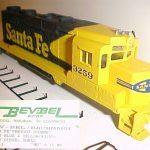 Outside of its service in Bachmann’s line, Kader sold shells to Bev-Bel and Front Range for use in GP30 offerings during the 1980s and into the 1990s. The original release Bachmann Burlington Northern GP30 of the late 1970s was identical to the one sold previously by Lionel-HO, with the only external difference being the name found on the model’s fuel tank bottom. Bachmann substituted silver in place of the roofline black color on Burlington Northern models beginning the early 1980s. Lettering for either example is similar and both models included road number 181, also shared with the Lionel-HO Burlington Northern GP30. Bev-Bel for many years released special runs of others company’s items in road names unavailable otherwise. The above example shows Bev-Bel’s Santa Fe Freight Warbonnet scheme GP30. The shell is the standard Bachmann GP30. Bev-Bel sold models such as this as a shell-only release. Front Range offered a variety of freight cars and a few diesels in the HO-scale market beginning in the 1980s. Front Range offered better performance drives built to ride under shells produced by other companies. Among the offerings of this type, Front Range sold a drive made for the Kader GP30 shell. Later, Front Range went a step further and offered a complete GP30 model that featured its drive and included a Bachmann shell. Towards the end of Front Range’s existence, the company announced an all-new tooling GP30 shell, as seen in the accompanying advertisement. This all Front Range GP30 never was produced.